FREE tools that allows you to freely and easily set up your own software catalogue, with thousands of fully populated products entries that you earn commissions for right away! You can started selling within several minutes and start earning commissions right away! (You can literally have a complete store set up within several minutes! And there is no charge to you!) Plus, you can sign up other people, and when they start making sales, you get a percentage of their commissions as well! It is free because we are only successful if you are successful (see below for more details). So obviously we want to see you as successful as possible! Go to the affiliate sign up page, and start selling now! You get 50% of all commissions generated! You get at least $5.00 for each of those commissions! (barring of course for example, vendors who switch prices). We do our best to make sure that only vendors who offer affiliates a minimum of $5.00 U.S. per sale are listed. That means, that each commission/purchase generated is at least $5.00. If it comes to our attention that a vendor has changed the commission, we may request that the vendor change it back to $5.00, or decide to drop the vendor from the catalogue. You can create your own tiered affiliate system, and get revenue from new affiliates! What this means is that, you get an additional percentage of all commissions generated, by people that you get to sign up! In this system, you receive a further 20% of all commissions generated by those that you sign up to start selling as well! A diagram has been included to illustrate this. Click here for details. You get to market and distribute your own version of software branded with your own logo! (You simply upload your own logo/website ID, and a special software build is created for you). This increases customer retention, increases your brand recognition, plus helps ensure that you get more sales in the future! 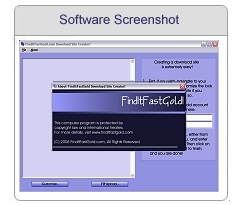 Using this software, people can search for software, similar to search engines. And the cool thing about it is that it is not cluttered with garbage like the search engines are, which makes it much more valueable! Futhermore, we periodically offer special offers and promotions to those using the software! We continually update and are current! Send us details of any feature requests or things you want to see included! We want to make it as easy as possible for you to make sales and be a success, because that is how we are successful, so we will do whatever we can to help ensure that you are as successful as possible! Click on one of the links below for more details, or click here to sign up and get started right away!